a) Engineered Unfinished Oak frame pack with loose pin stops, and with a 133mm lining depth. 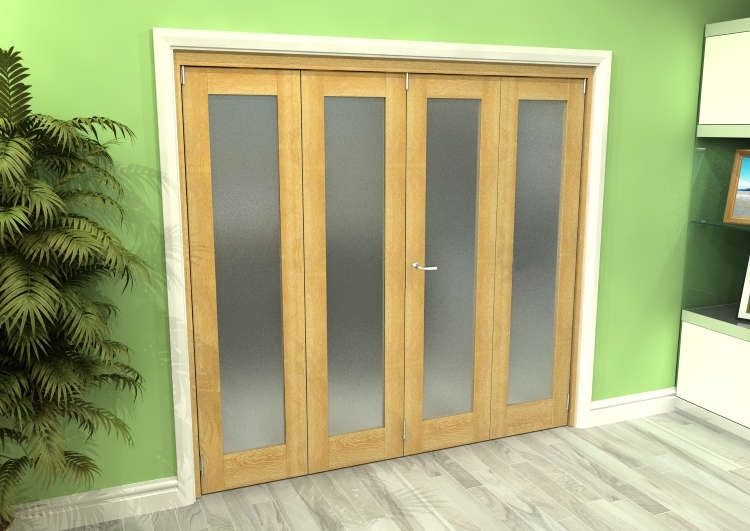 b) 4 x 533mm x 1981mm x 35mm thick Frosted Prefinished, Engineered Oak solid core doors, with toughened glass. The only items that you may need, but aren't supplied is the architrave, and door handle / latch. These sets are an ideal, robust, and well engineered solution to creating an Interior Folding Door system to meet your needs. These sets can be trimmed in height and width. Please give us a call for advice. These sets are also ideal, where you are fitting them onto / over an existing floor covering - where the gap below the doors can be kept to a minimum. Fitting instructions supplied. Please note all our sets are fully reversible so you can hang the doors folding to the left or right.